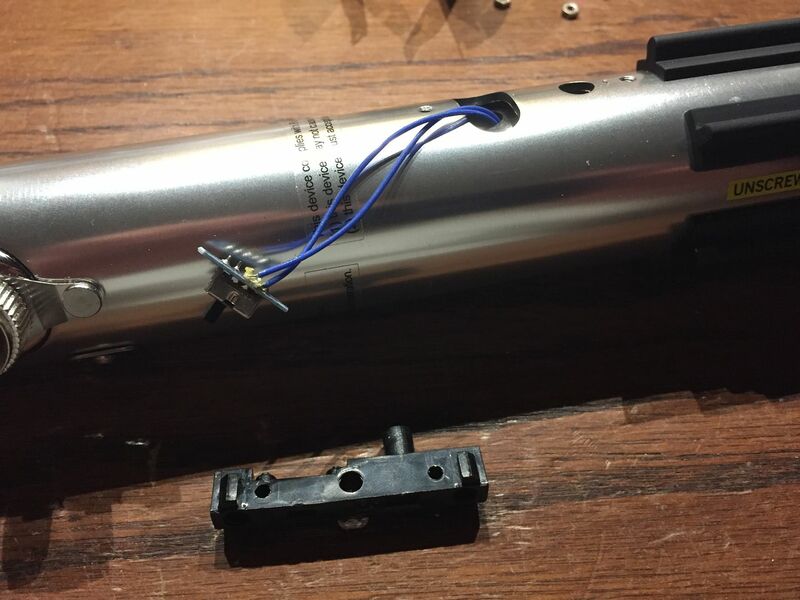 Below is my tutorial for disassembling and converting your Rey (Jedi Training) Black Series Force FX Lightsaber, released on Force Friday II (September 1, 2017). 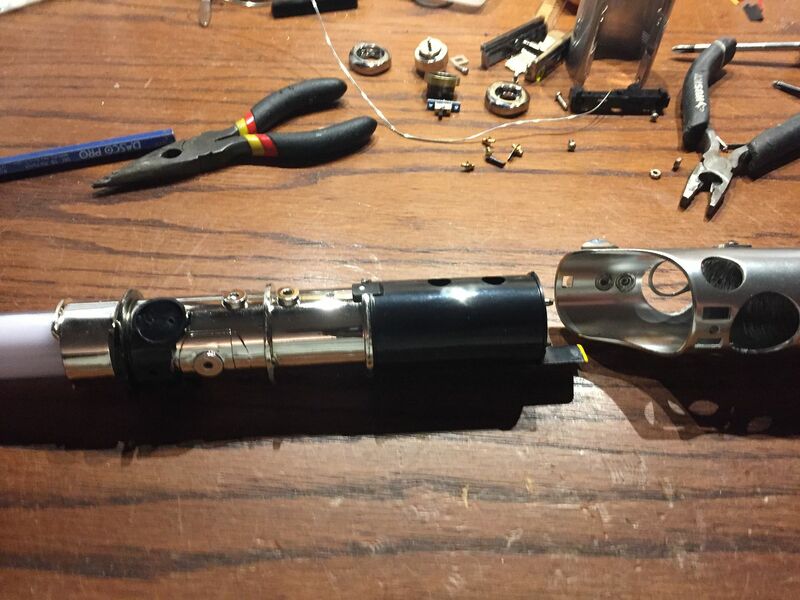 This tutorial will show you how to take apart your saber, replace the permanently attached string blade with a removable dueling blade, install an in hilt LED, and replace the plastic blade holder with an aluminum Luke ANH conversion kit blade holder from TCSS. 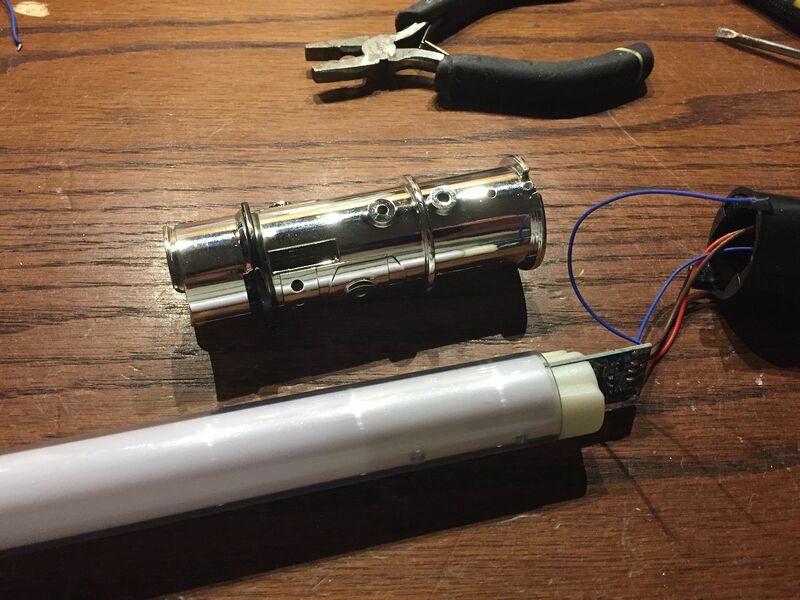 NOTE: This tutorial is NOT for the D23/Disney Parks exclusive version of the Rey Graflex lightsaber that has a removable blade. 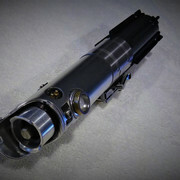 That saber is a completely different model, and I will be posting a conversion tutorial for that model soon. 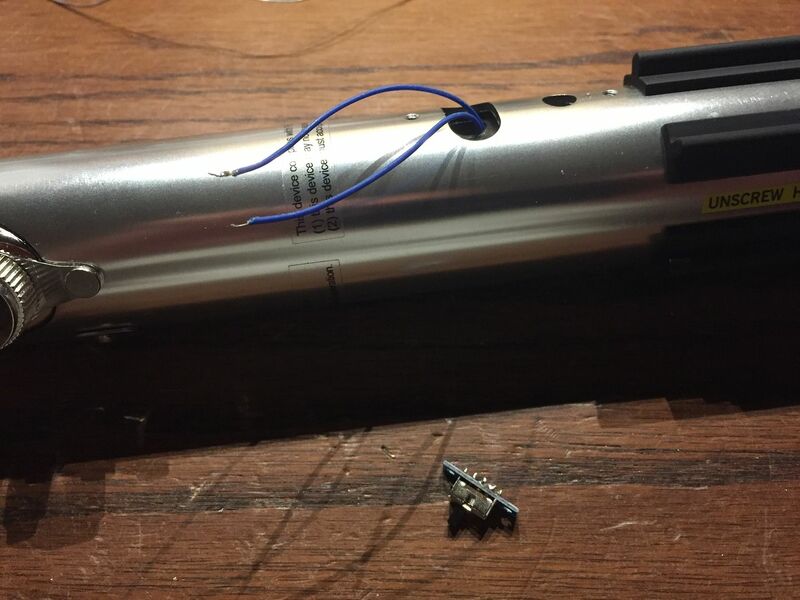 This tutorial assumes you have basic knowledge of electrical soldering and wiring, as well as some familiarity with Master Replicas, Hasbro, or Black Series Force FX Lightsabers and how they’re generally constructed. 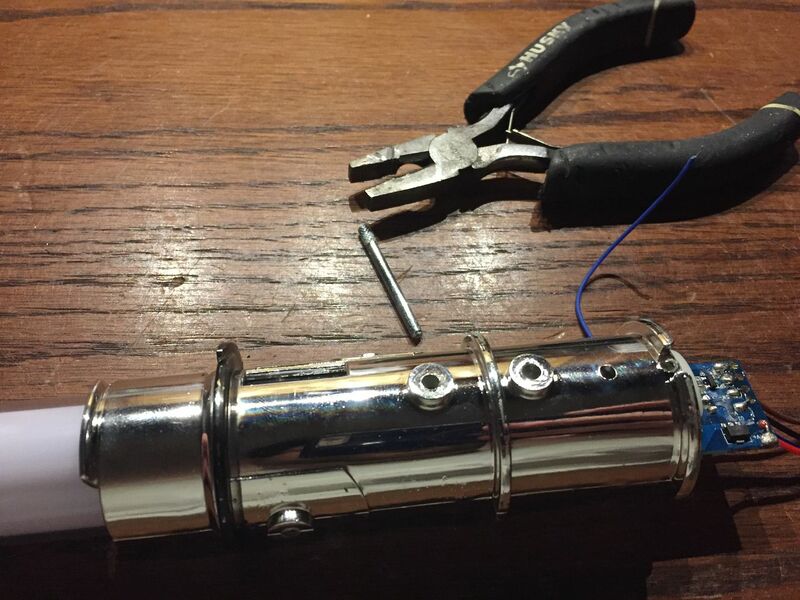 Start with your Rey lightsaber. 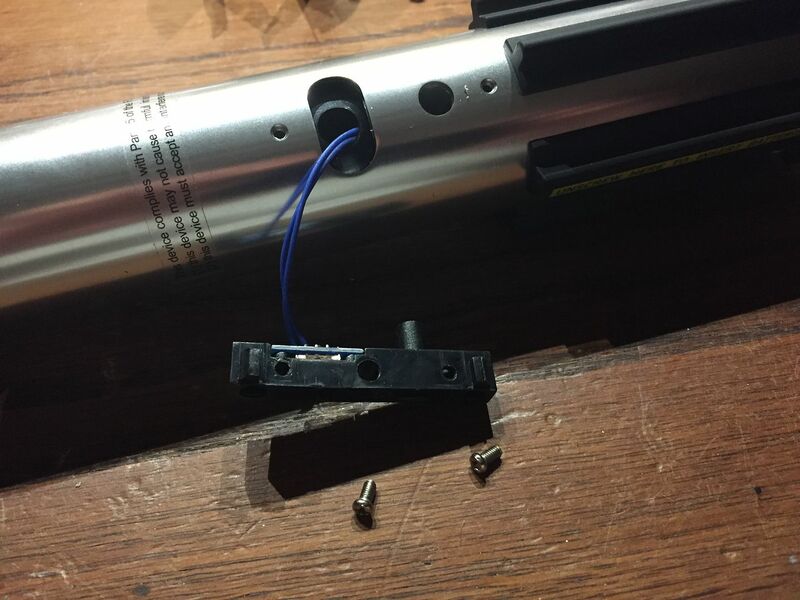 Unscrew the pommel and remove the battery pack. See this pin holding the clamp lever in place? 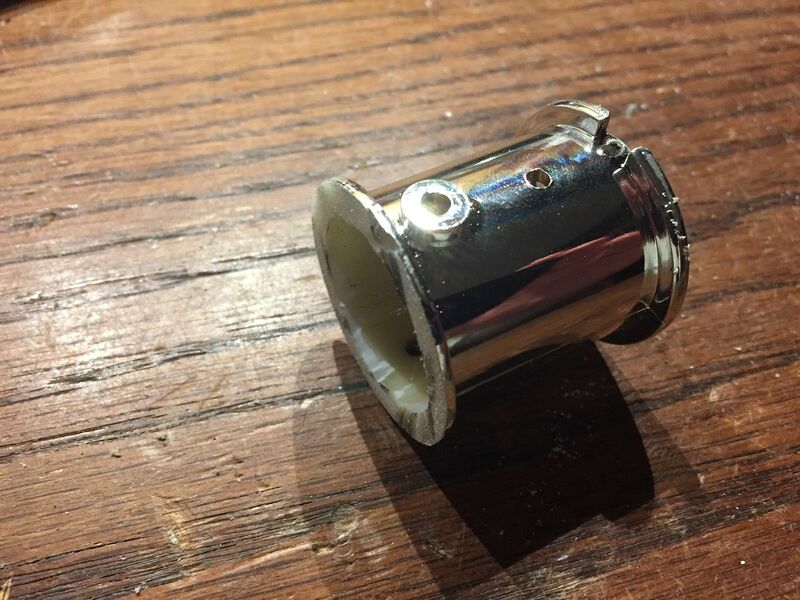 You will need to remove it, either by punching it out from the backside with a punch tool, or by using pliers to grab it from the top side and pull it out. 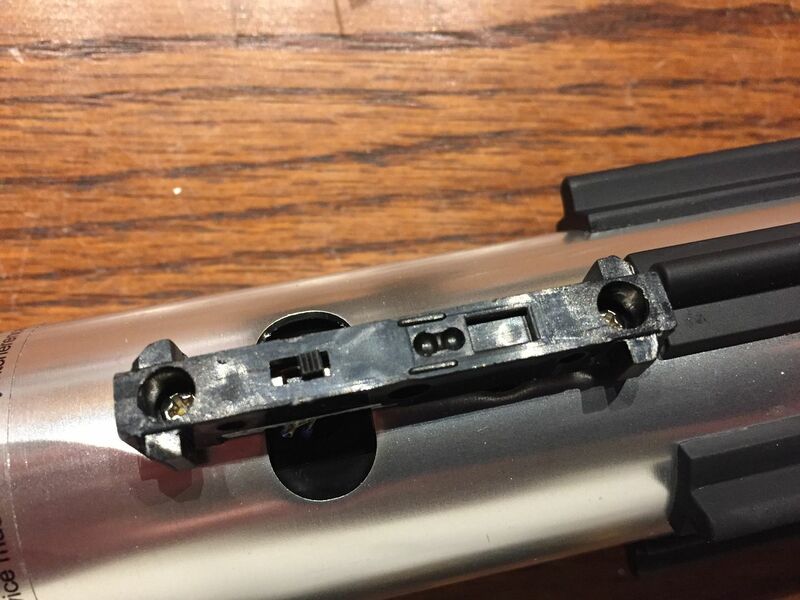 Once the pin has been pulled out of the clamp lever, the entire clamp box assembly can come apart like so. 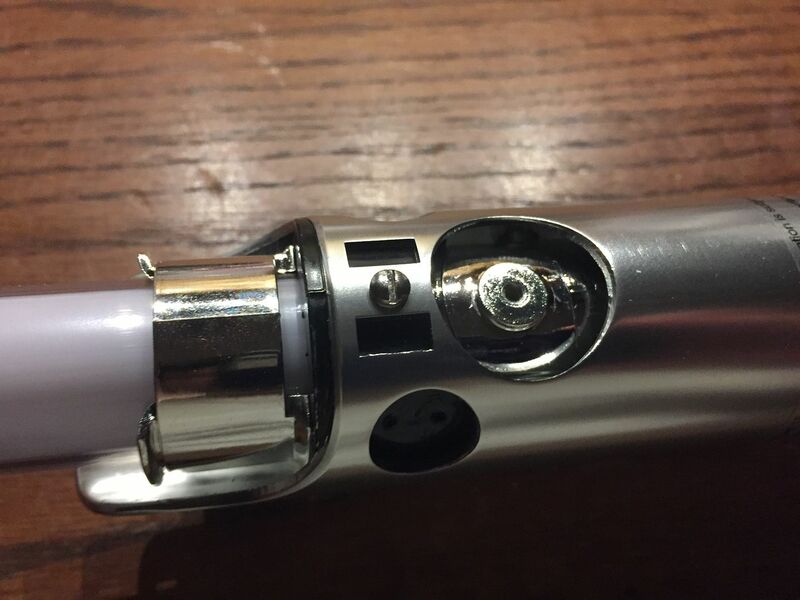 Use Phillips screwdriver to unscrew the two screws holding the clamp bar in place. 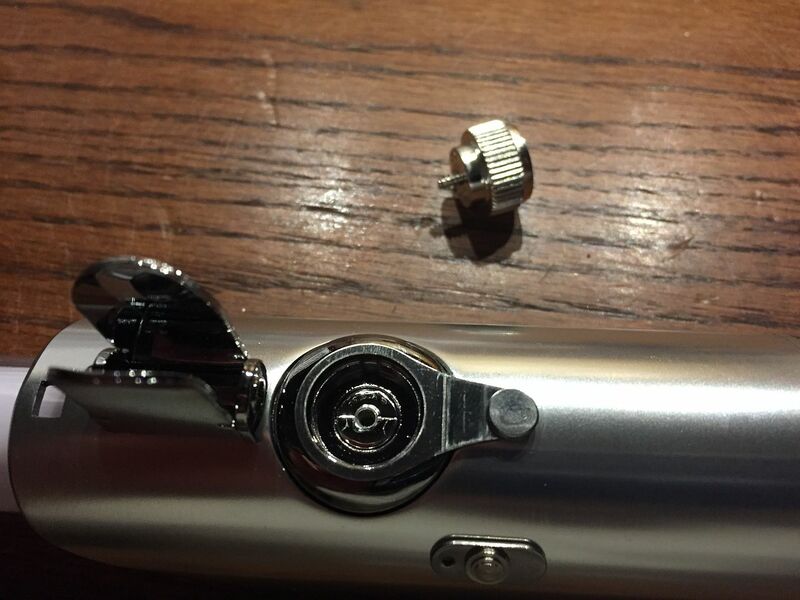 Once the two screws are out, you can slide the clamp bar up over the top of the hilt and past the blade. 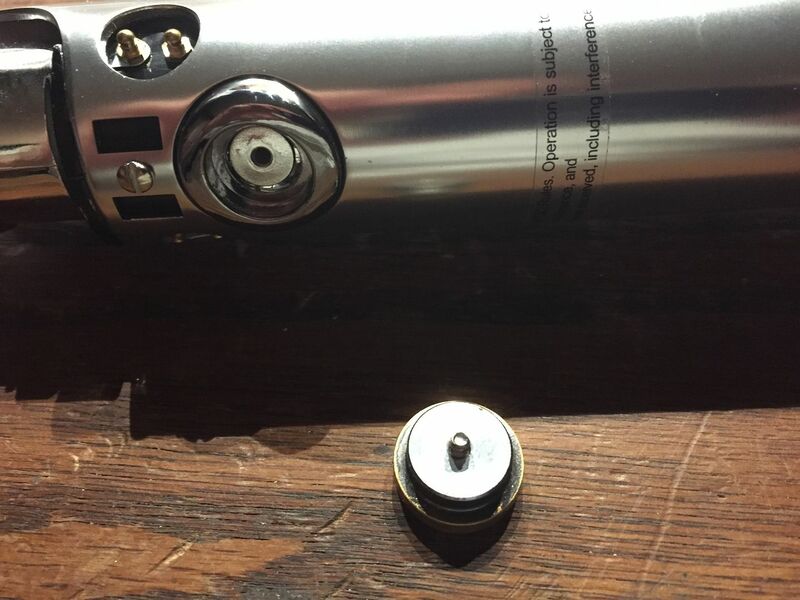 Use a small Phillips screwdriver to unscrew the two screws holding the black switch casing into the hilt. 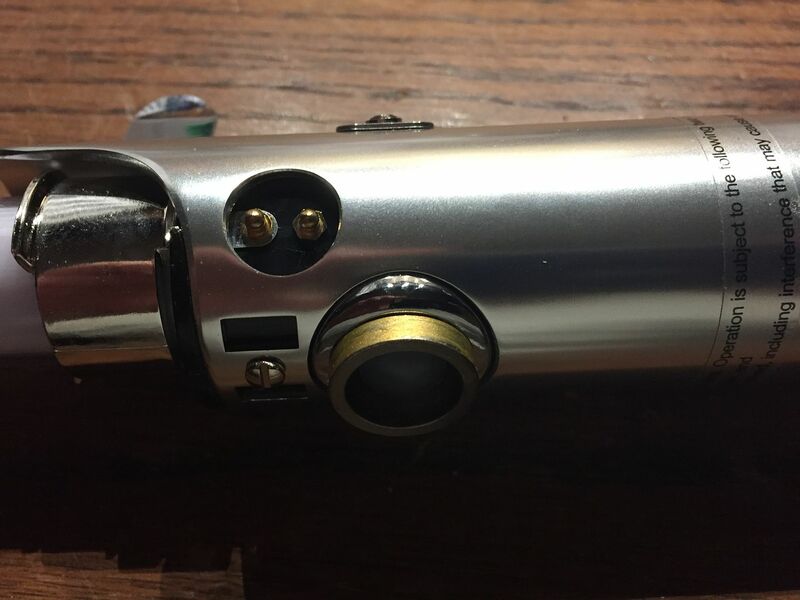 You can then pull the switch casing away from the hilt. 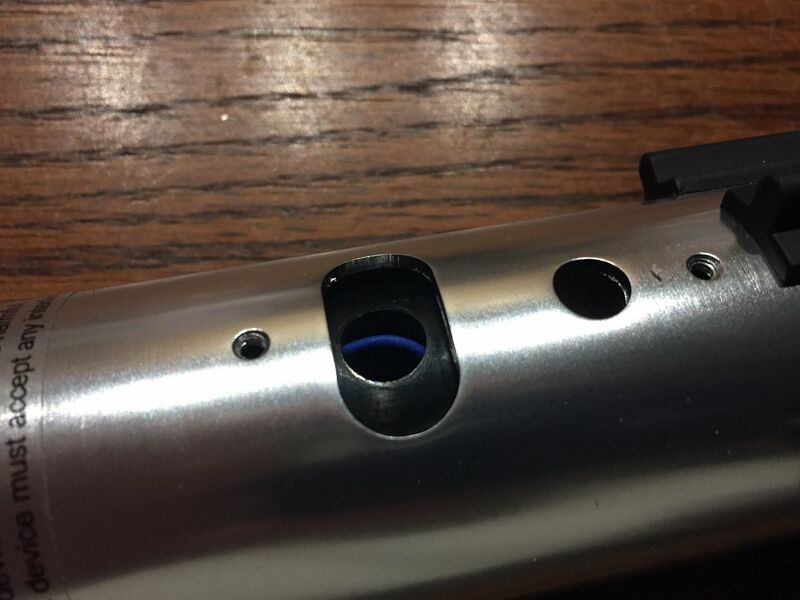 Remove the switch from the black plastic switch casing. Unsolder the two blue wires from the switch. 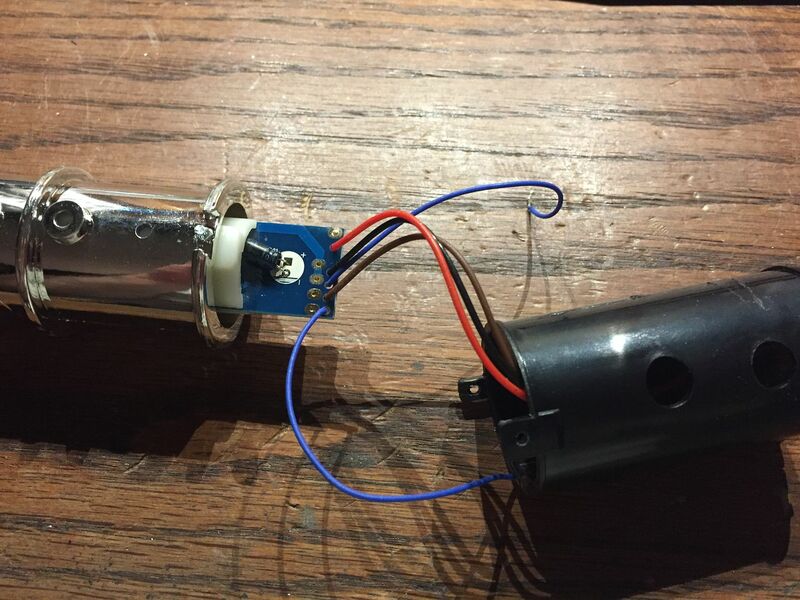 Push the two switch wires into the hole in the hilt. Now we’re going to unscrew the red button. 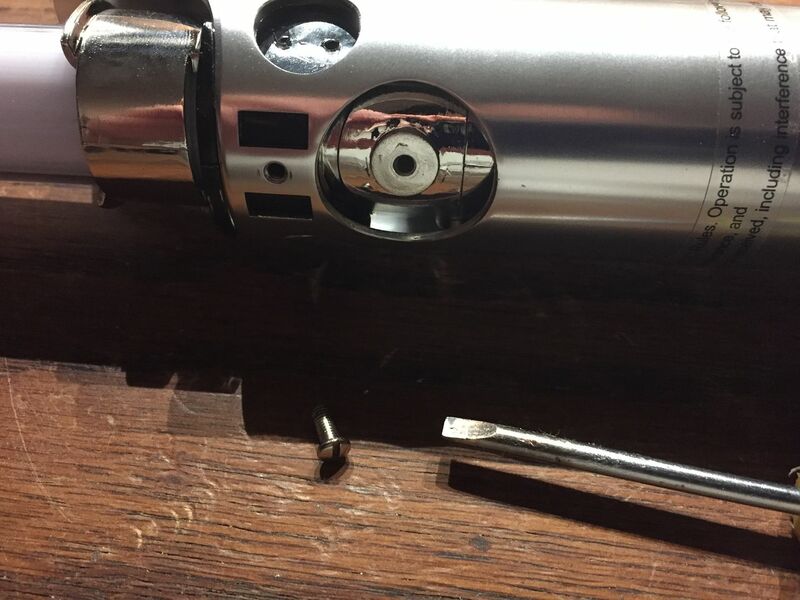 The entire red button is one piece that unscrews very easily, a marked improvement over the older Hasbro ANH Graflex sabers which required you to pop the red button out of the silver bezel before you could unscrew the screw. Move the beer tab aside. 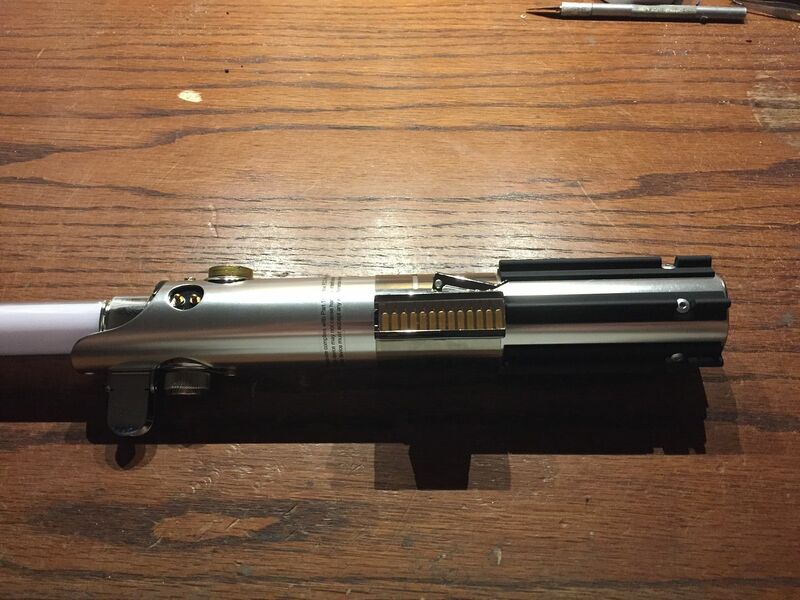 Pop the chrome bezel out of the hilt. Now we’re going to remove the glass eye. Like the red button, the glass eye is one piece now that unscrews very easily. You may need rubber gloves to get a better grip on the smooth edges of the glass eye, but it will unscrew easily. 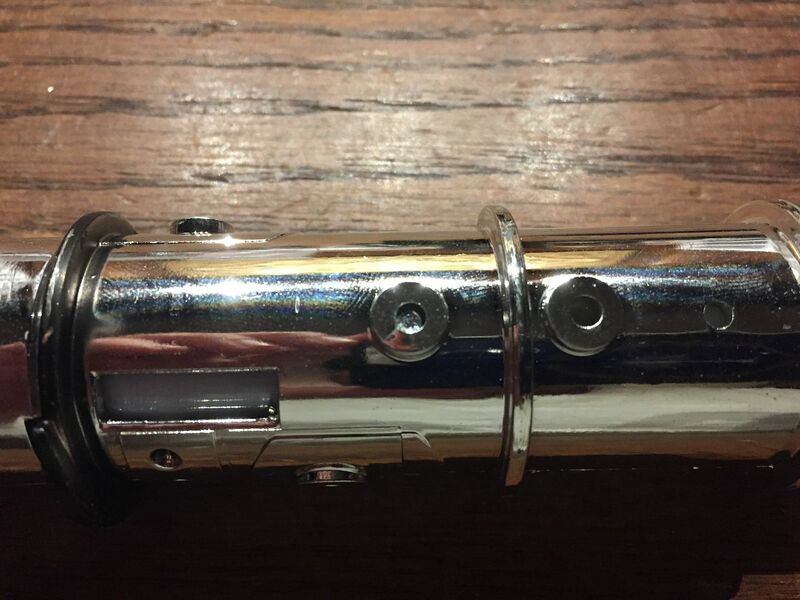 We’re now going to remove the brass pins (two on each side of the hilt). 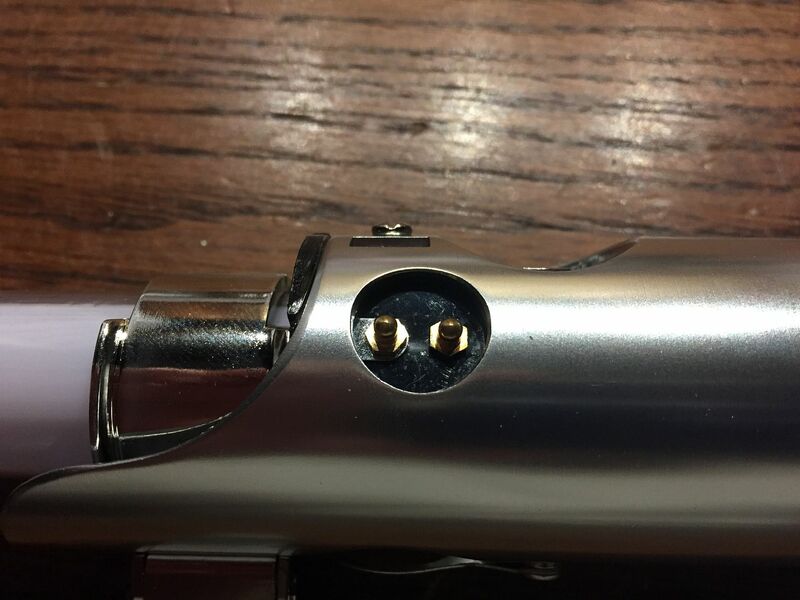 The pins are not threaded, so you can remove them using pliers to grasp the pins and pull them out. It does not matter if the pins are damaged, we will not be reusing them. 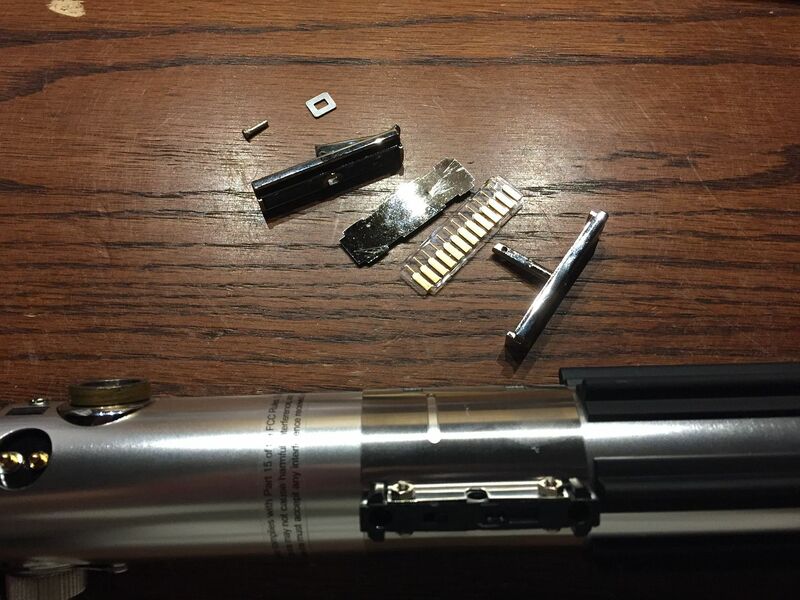 Instead we will use the short graflex pins from TCSS that are threaded and fit into the Luke ANH conversion kit. 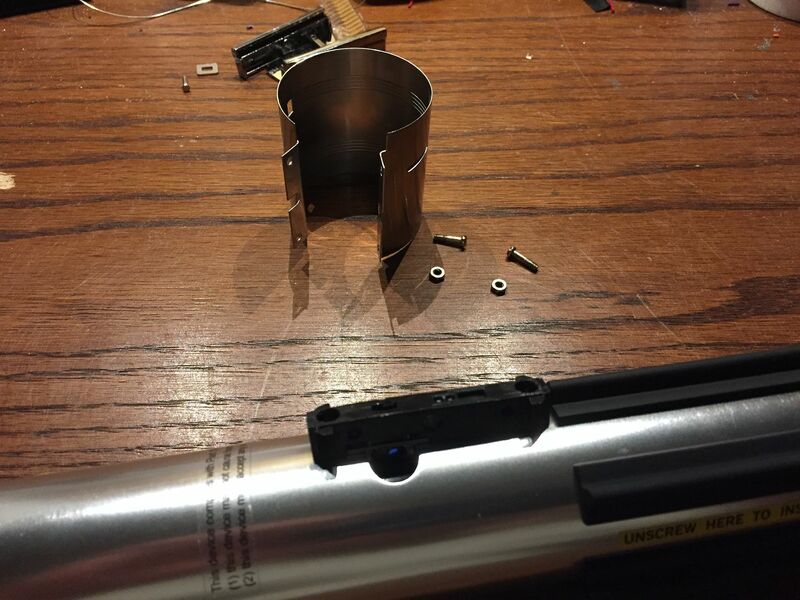 Now unscrew the slotted screw near the emitter. 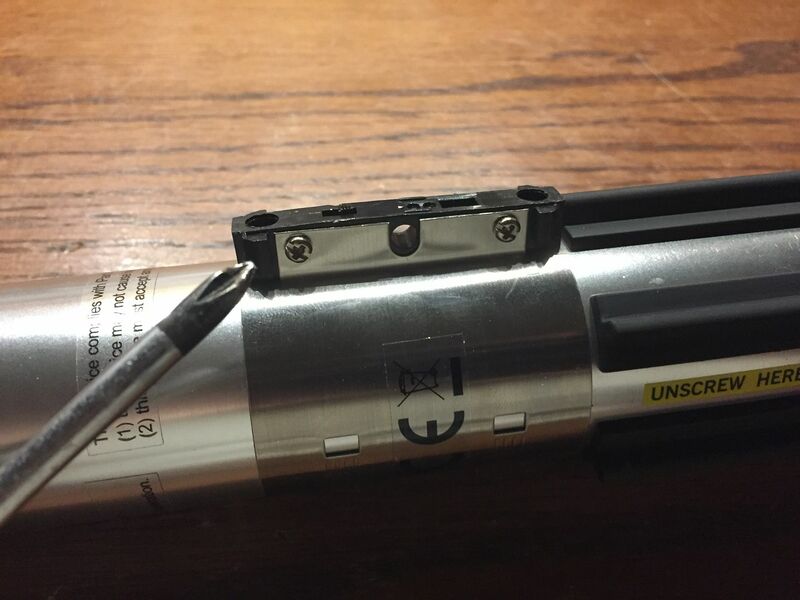 You should now be able to pull the blade and internal electronics up through the top of the saber, leaving the hilt empty. 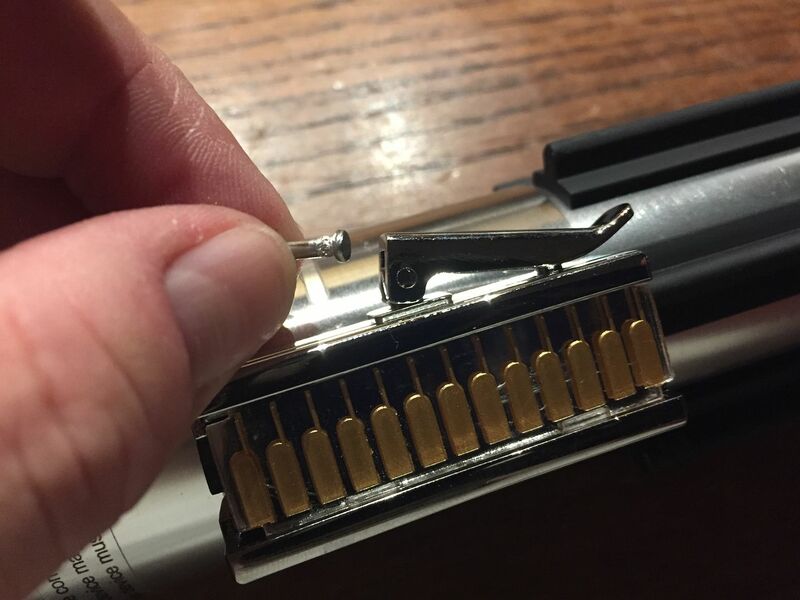 Remove the black plastic piece that the brass pins sat in. 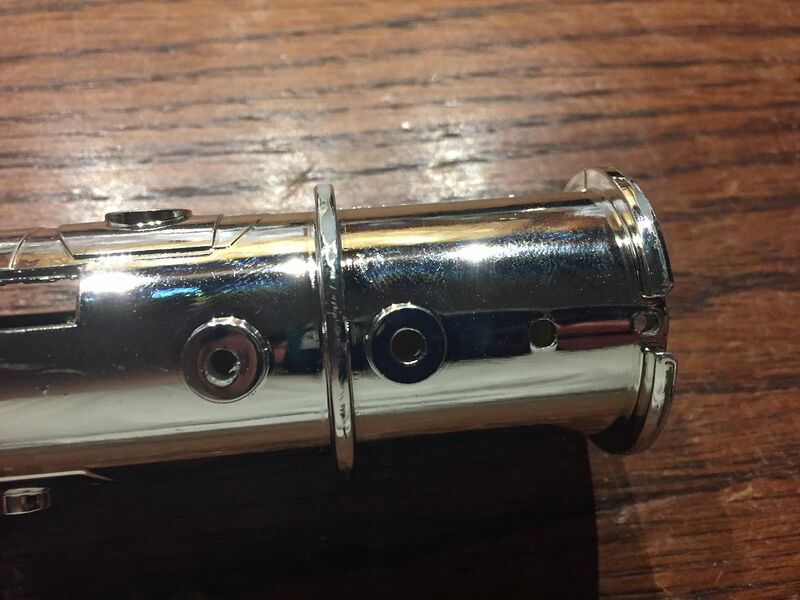 There are two pins (one on either side) holding the silver and black sections of the internals together. 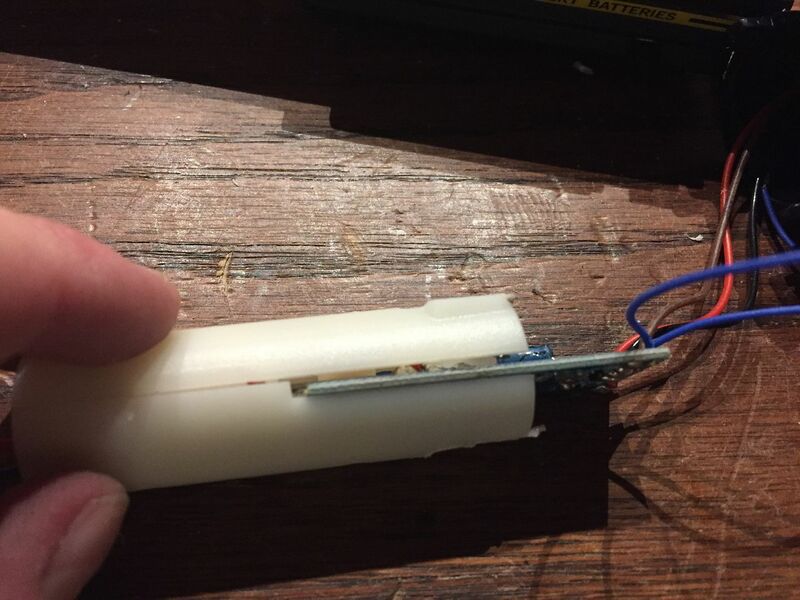 Use a small punch tool to punch these two pins into the chassis. 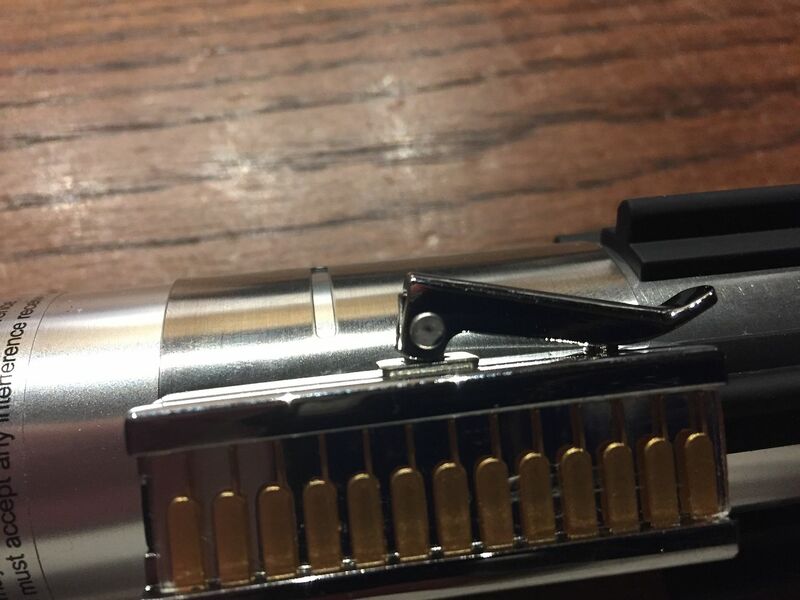 Once both pins are punched in, you can separate the black section from the silver blade section. In the middle of the silver chassis section there is a pin. 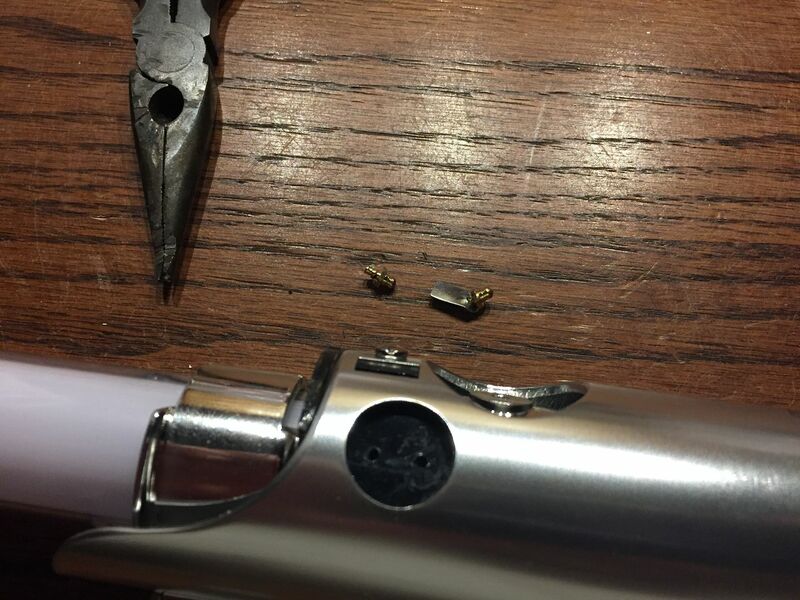 Use a punch tool to punch the pin out through the other side, and then use pliers to grab the pin from the other side and pull it all the way out. 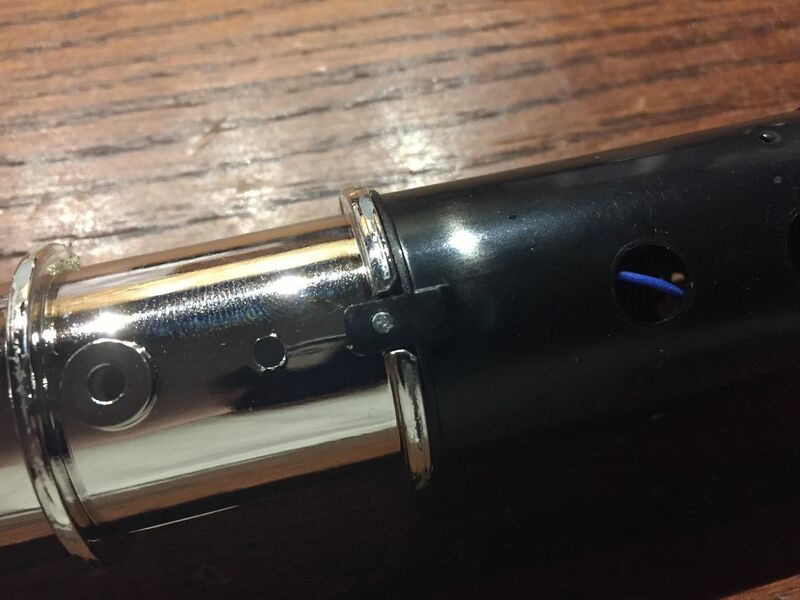 You can now slide the silver emitter section up over the blade and remove it entirely. We’re going to use a dremmel cutting wheel to cut the silver emitter piece right at this middle ridge. 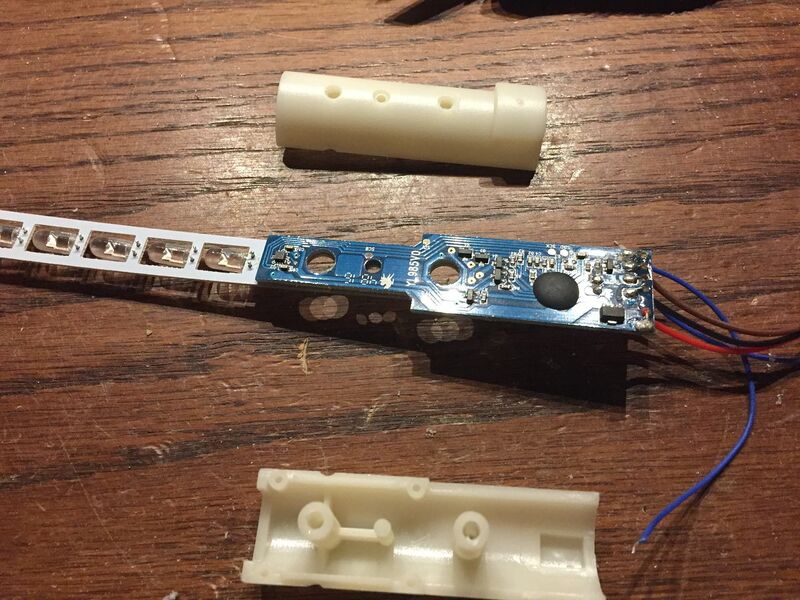 Now get your Luke ANH conversion kit ready. 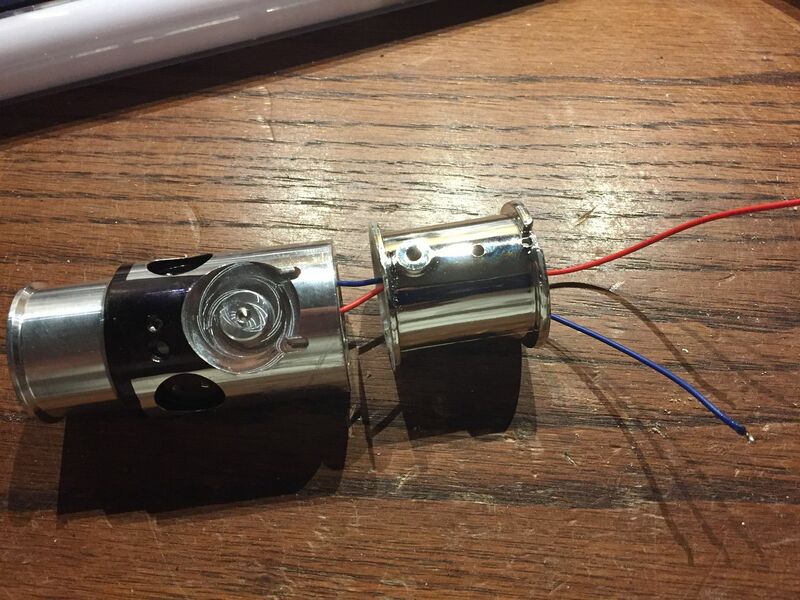 Wire up your LED of choice so that you have a single positive wire and a single negative wire coming out of the bottom of the heatsink. 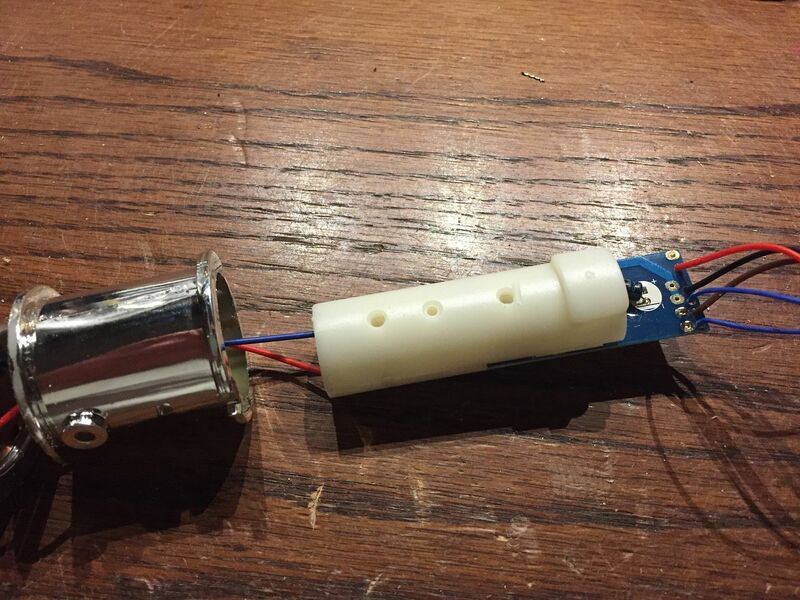 Tin the tips of your wires in anticipation of soldering them onto the soundboard. 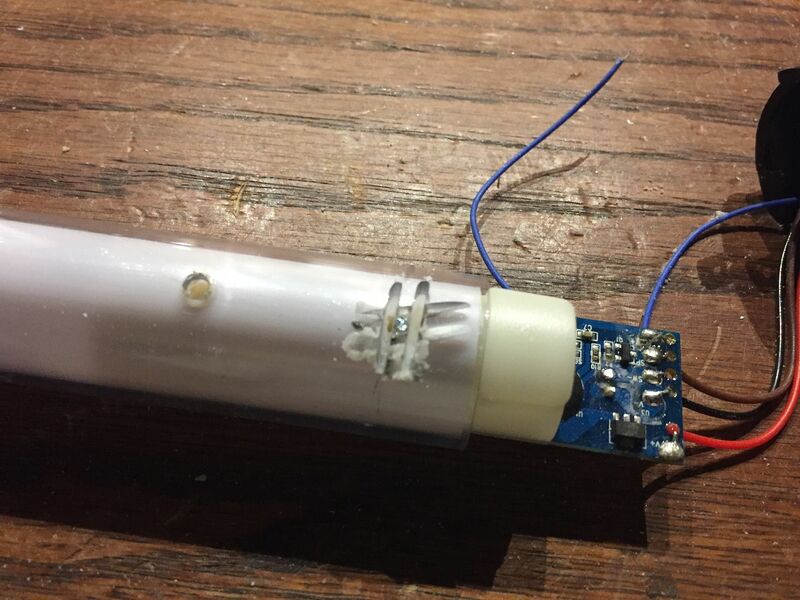 Slide the cut portion of the silver emitter part over the LED wires. 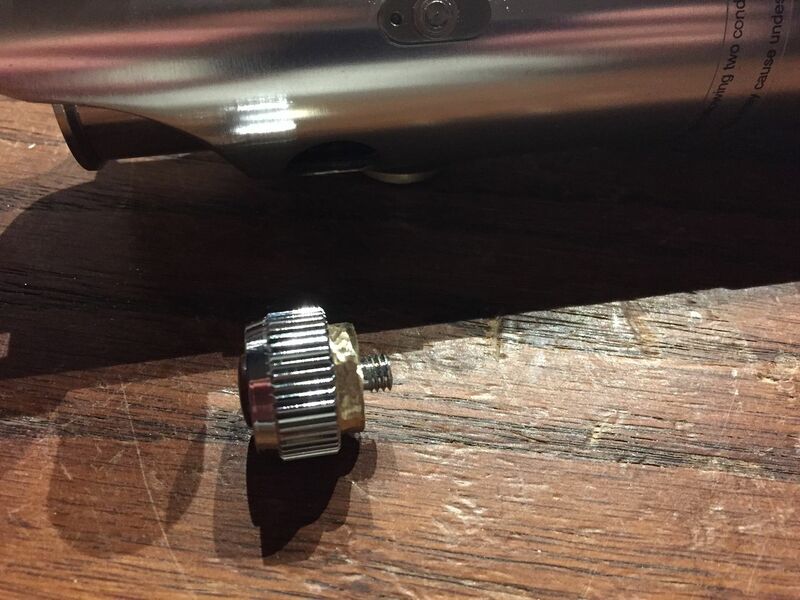 Now we’re going to remove this little pin that locks the soundboard into the blade. Use a dremmel or other cutting tool to cut away some of the blade around the pin, and then use pliers to pull the pin out. 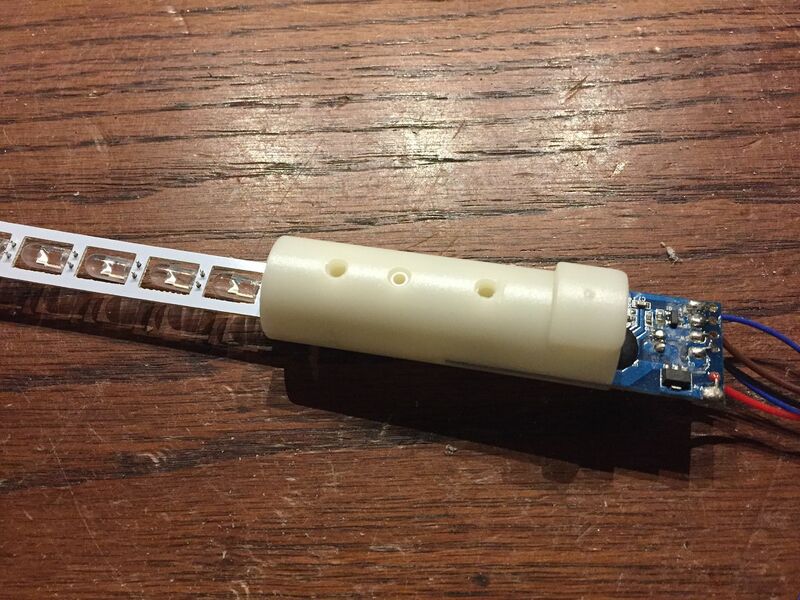 You can now pull the plastic blade off and reveal the string of small LEDs attached to the soundboard. Open up the soundboard assembly. Flip the soundboard over, and cut the LED strip at the edge of the soundboard. 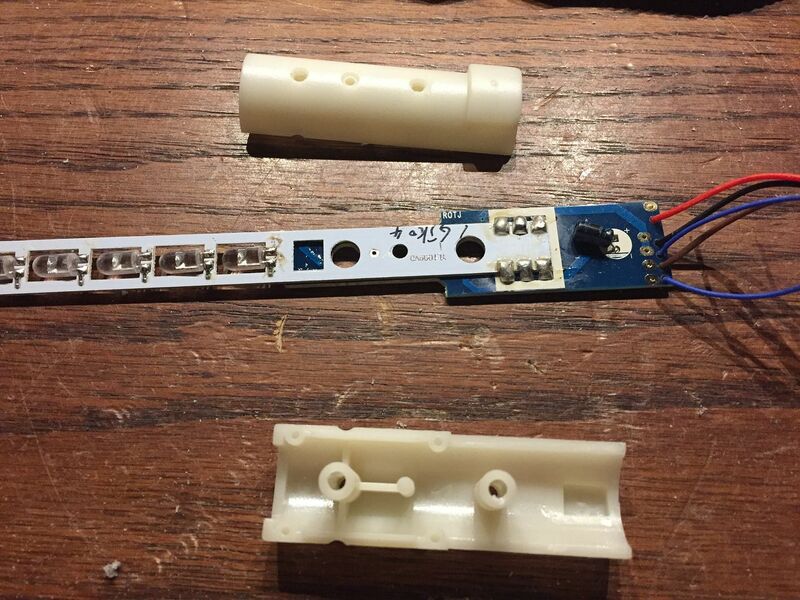 Be careful not to cut the blue soundboard itself, only the white strip of LEDs. You will see six solder pads, which are (from top left, going counter-clockwise) 1, 2, 3, 4, 5, and VDD. Bridge pads 1-5, being careful not to bridge them onto the VDD pad. 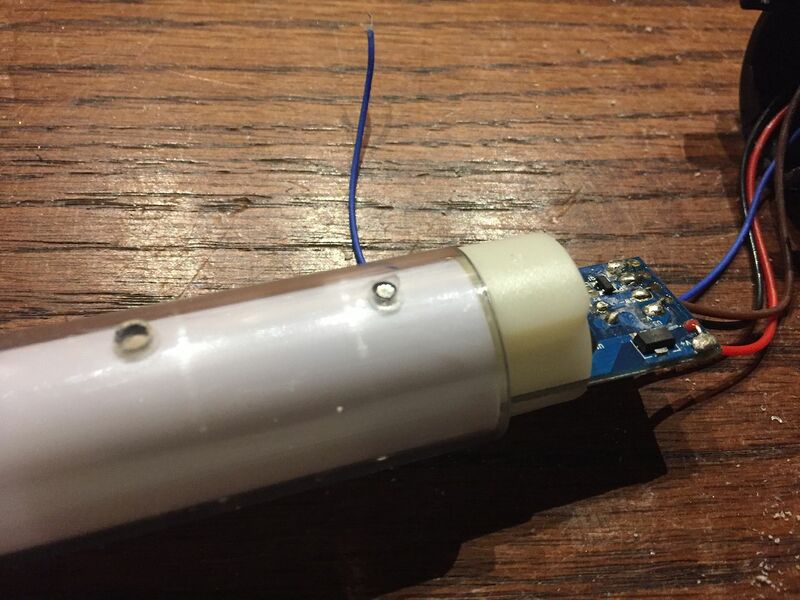 Now solder the LED positive + wire onto the VDD pad, and the LED negative – wire onto the bridged 1-5 pads. Sand down the nubs on either side of the soundboard casing, then push the soundboard further into the black chassis section. It should go all the way in so that the soundboard casing is no longer visible. 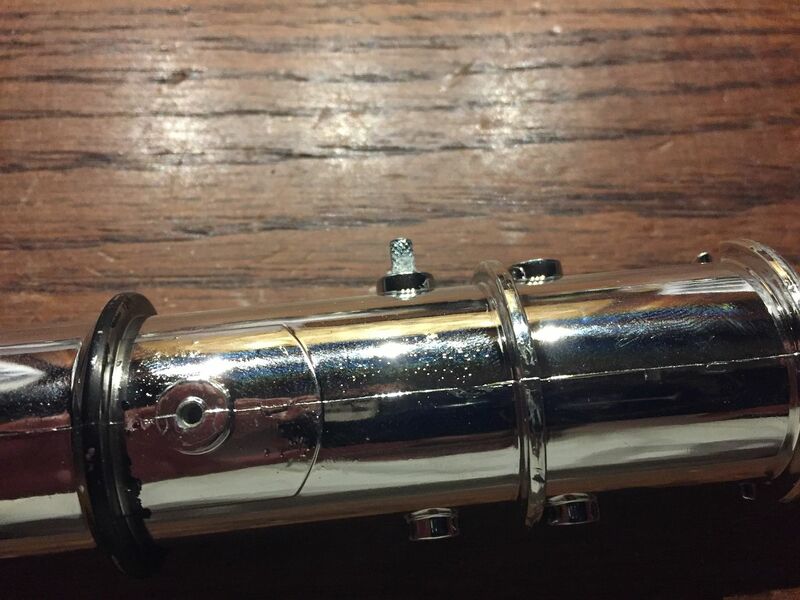 Reinstall the pins to lock the cut silver section to the black chassis section. Reinstall in reverse order. 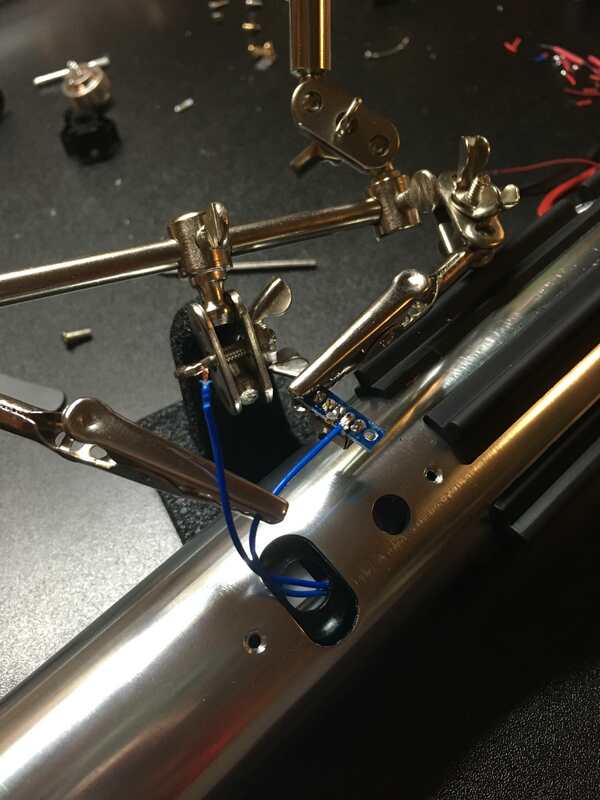 Make sure your blue switch wires are positioned inside the chassis such that they can be pulled out using tweezers once you push the chassis back into the hilt. 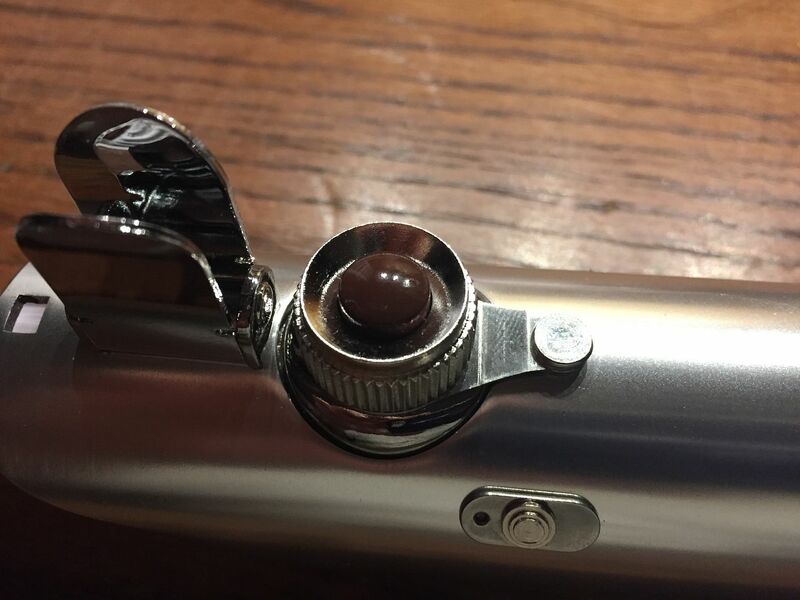 I opted to replace the plastic glass eye and red button with metal replicas from TCSS. 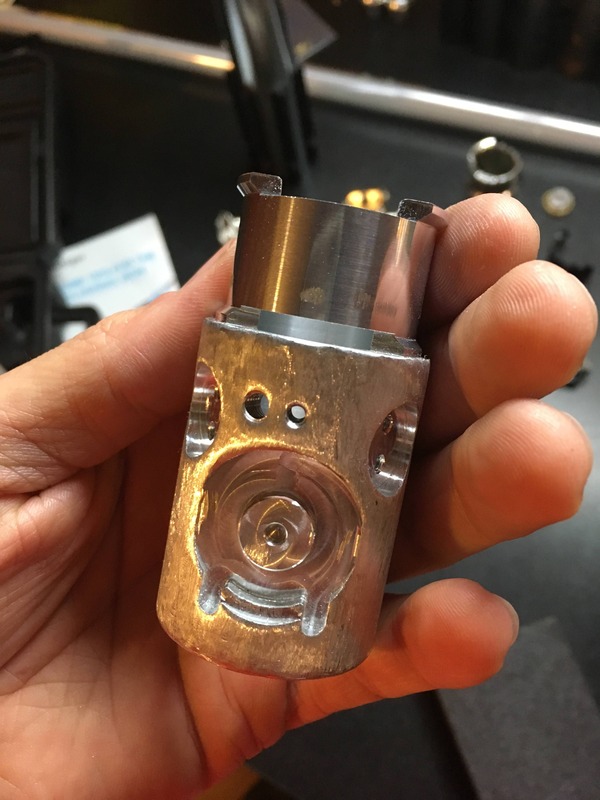 The base of the red button needs to be sanded down to fit inside the chrome bezel in the hilt, and you’ll need to cut down the thread length so that they don’t interfere with the blade. 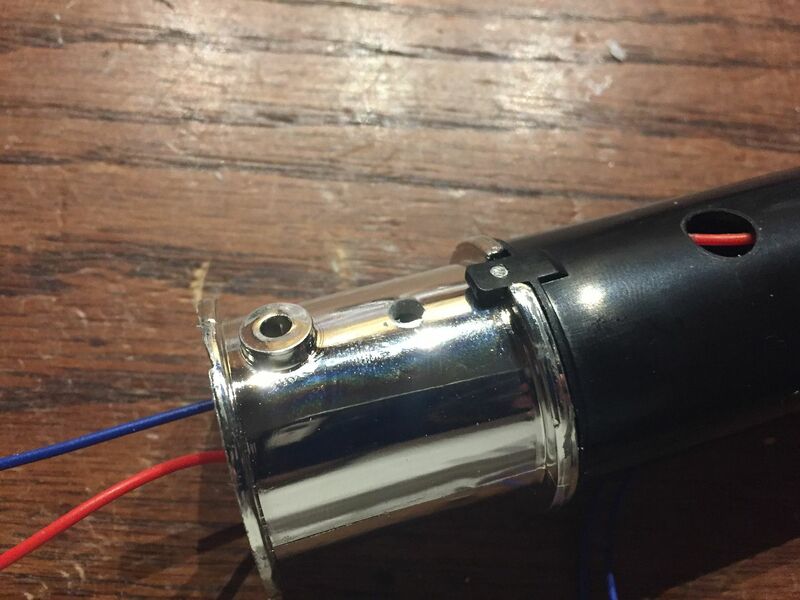 Otherwise, if you prefer to reuse the stock glass eye and red button, you will need to super glue them in, as the Luke ANH conversion kit comes predrilled with a larger hole than the thread size on the stock glass eye and red button. Congratulations! 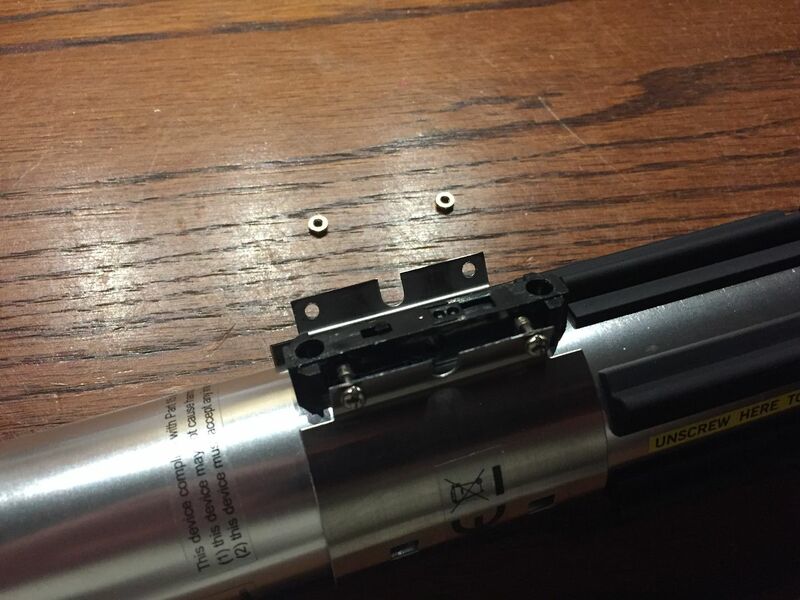 You have successfully converted your Rey (Jedi Training) Black Series Force FX Lightsaber! Amazing, you didn't waste any time! Great tutorial. Very similar to the HBS ANH Luke. Stay up late to finish that? Awesome work though. 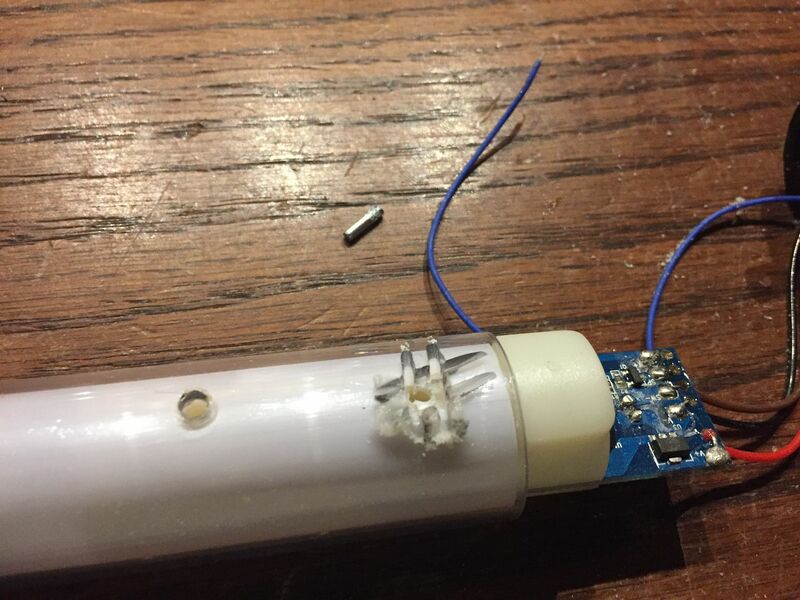 You used the regular battery pack to power the 12watt led? The (original) glass eye looks strange to me, and the clamp card is too blingy. It's too bad they didn't make a relic styled saber. Last edited by Whosle; 09-02-2017 at 10:28 AM. Awesome Shameem. You did that one quicker than Kylo. Fast work! Watched your review and conversion vids before I saw this post. 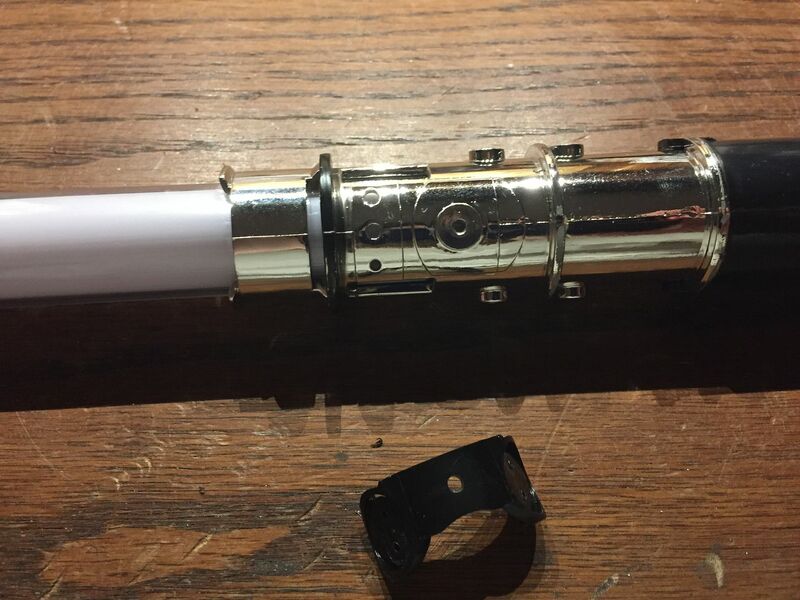 Pay 150 on Force Friday for a new piece and tear it apart the same day!!!! Ha! Followed your tutorial Shameem. Great job. I would like to just point out that the glass eye is actually some sort of aluminum or alloy. It feels plastic but i decided to drill it out for a reveal eye and discovered it was indeed a thin metal. 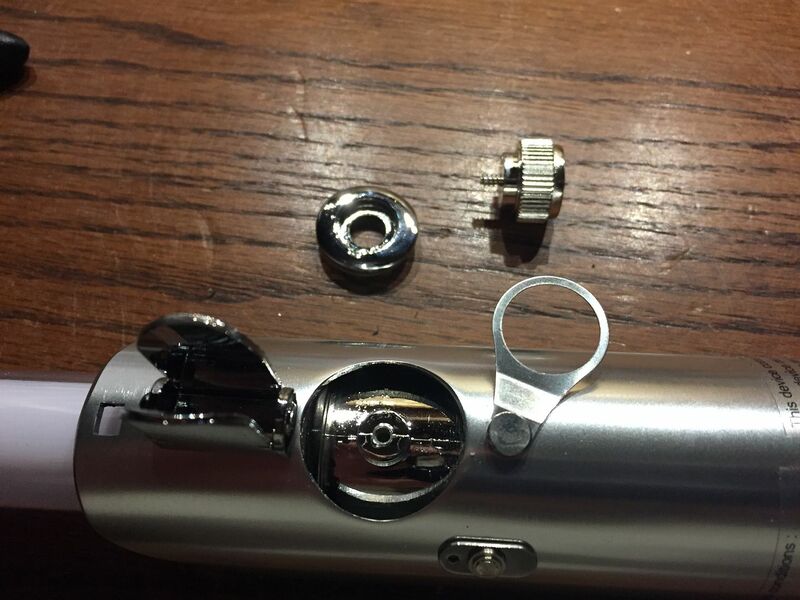 I was able to pop the glass out first by pressing on the screw side and the screw forced it out quite easily. Then i drilled the opening a bit bigger to allow more light to pass and reset the glass. 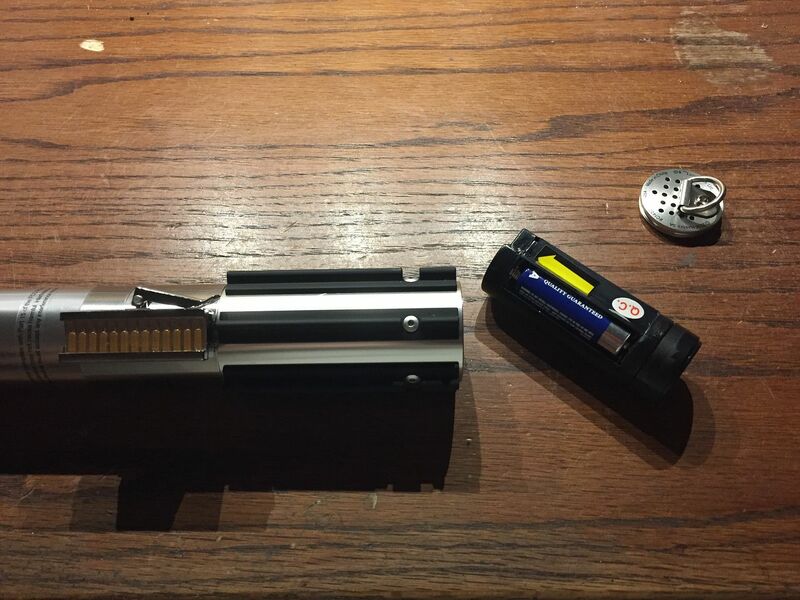 The assembly was then glued to the hilt and it worked out great. Should have taken pics of this but anyway, came out pretty cool. And your tutorial was spot on. Thx! 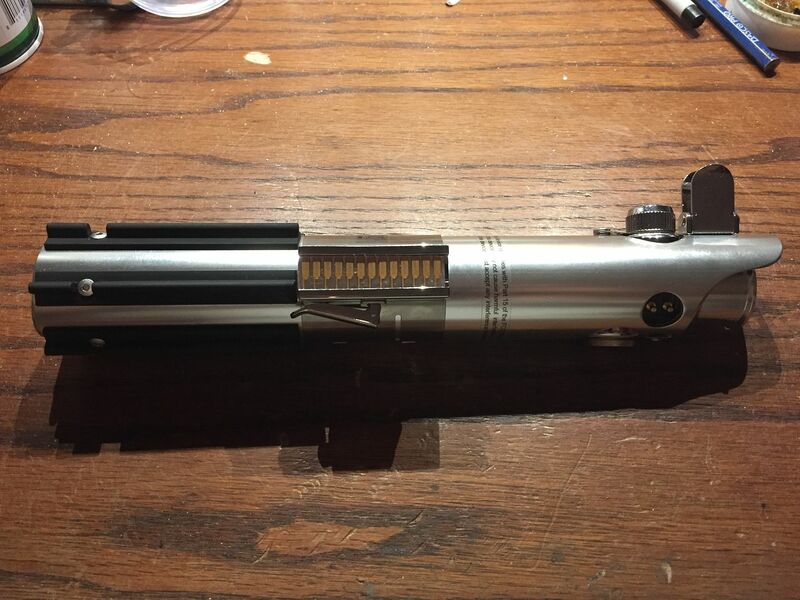 Oh also, i used a conversion kit from Saber supply on etsy instead of the TCSS version. 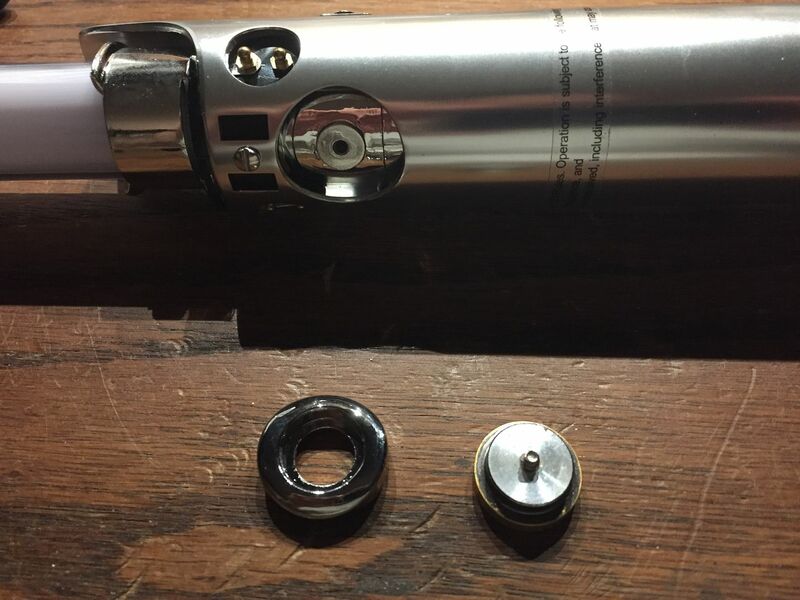 For some reason i was having a very difficult time fitting the TCSS blade holder into the hilt. 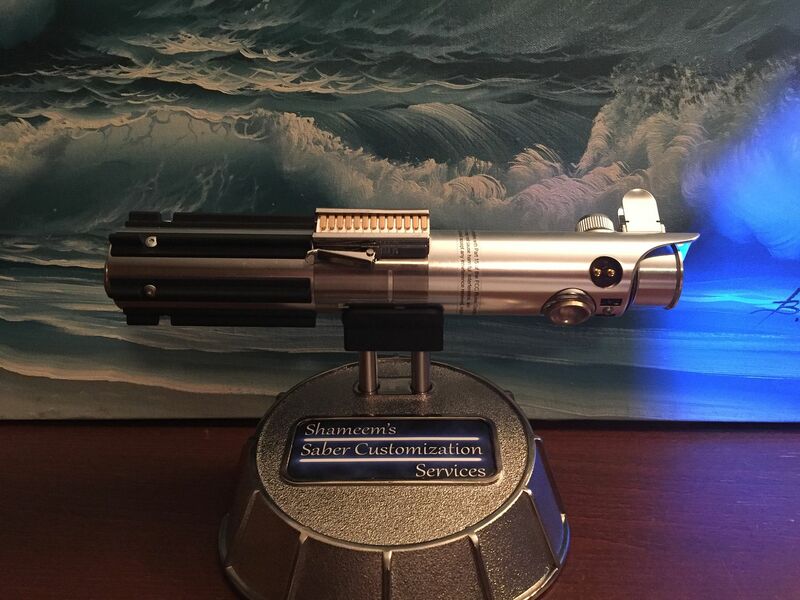 I notice that you used the older version of the Luke BS blade holder. Perhaps the newer version is slightly larger for some reason. Regardless, Happy with the results and couldn't have done it without you awesome tutorial. Thanks man! Last edited by BONES22; 09-13-2017 at 04:49 AM. I followed the tutorial shot by shot. for some reason, when i did the test the sound came on but not the LED lights. i double, triple check and stick have no idea why its not working. Everything was bridged correctly but i noticed in the test that those wires get hot. Help will be much appreciated. Just got the conversion kit and will be upgrading to the TCSS button and glass eye also. I didn’t realize I’d have to drill and tap the holes for them. 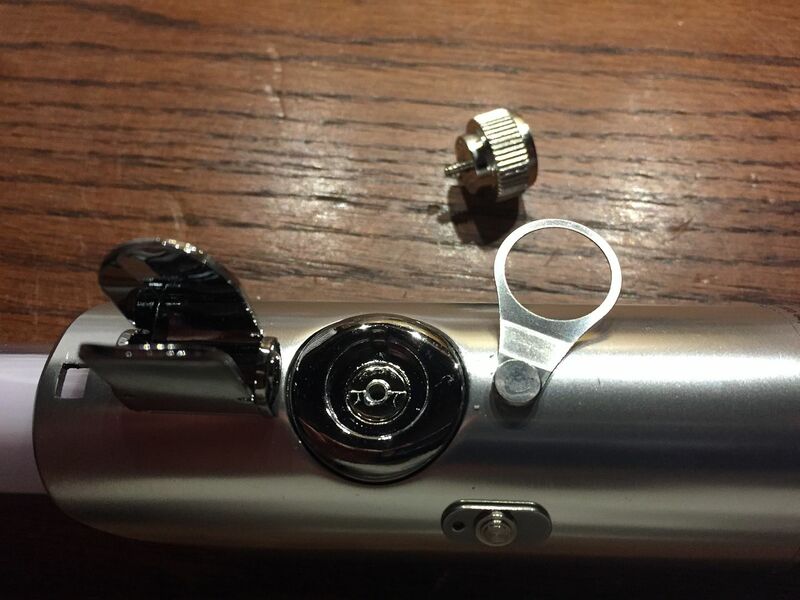 Anyone know what size tap I need to use? Edit: 10-32, I figured it out. Last edited by Geof; 12-10-2017 at 02:42 PM. helllo!! 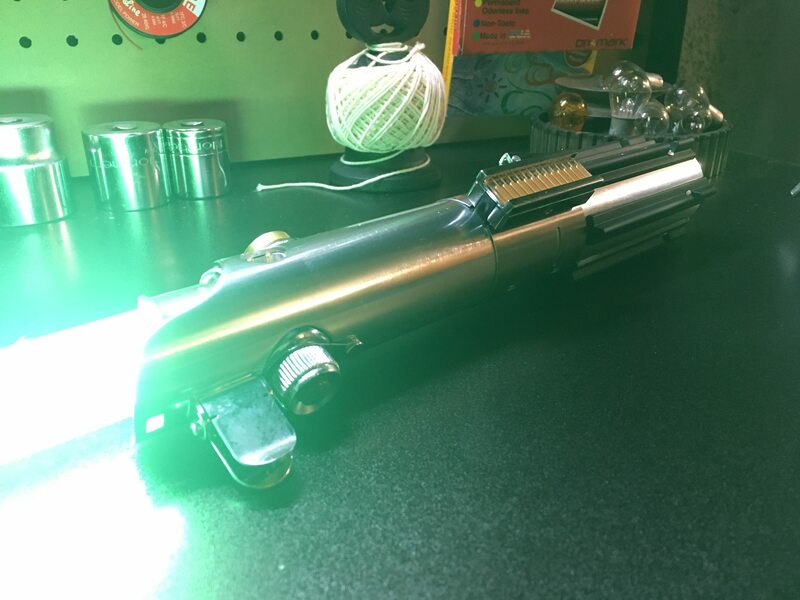 i have the rey fx saber and i would like to make the blade removable. 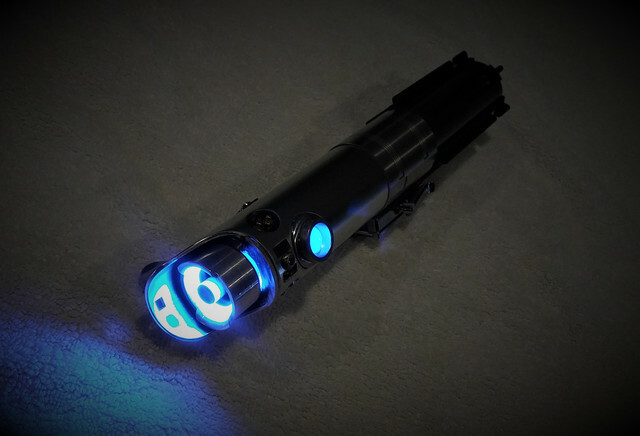 i dont care much for just one led light in the hilt lol i like the scrolling efffect and would like to make my own blades also so if it breaks i can fix it or swap it out.. The leds and sound board in that one picture http://i3.photobucket.com/albums/y82...o/IMG_1555.jpg.... would you let me know if this method would work... 1.pretty much you desolder the led strip from the soundboard, 2. then add a 6 pin connector to bridge the connection... would that technically work ?? all these tutorials i keep running into the pictures never show up (except this one!). thank you! Last edited by acmusic; 01-19-2018 at 04:07 AM. What a great tutorial! I've got everything apart, just need to wire my Tri Cree. 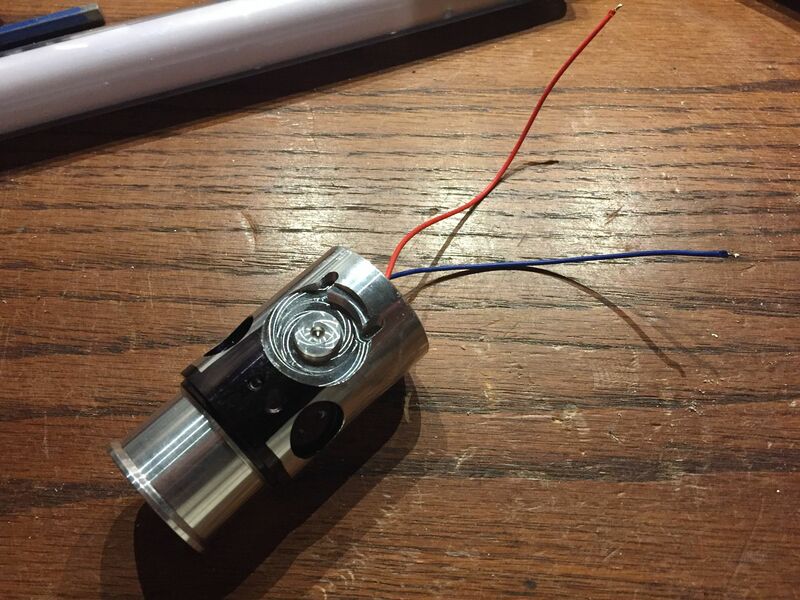 After some research here on the TCSS forums and elsewhere, I'm confused about wiring. 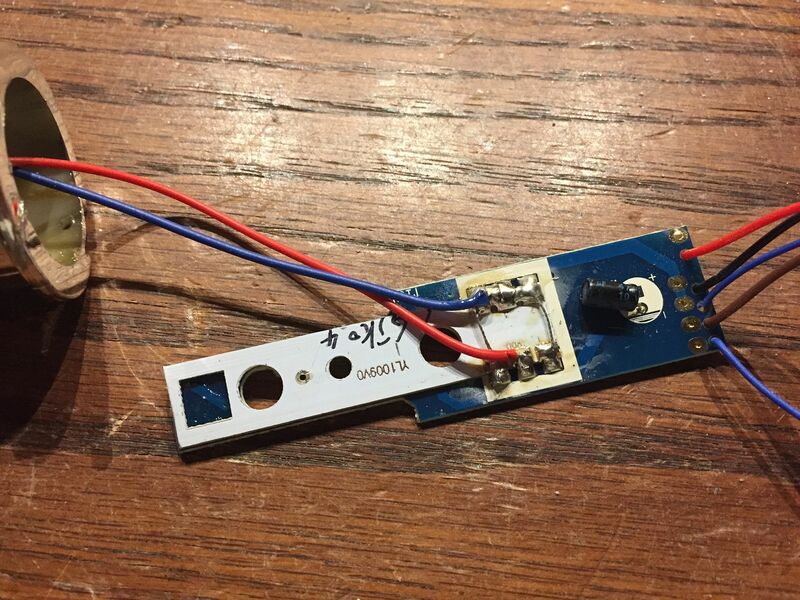 With this conversion, I do NOT need any resistors, correct? 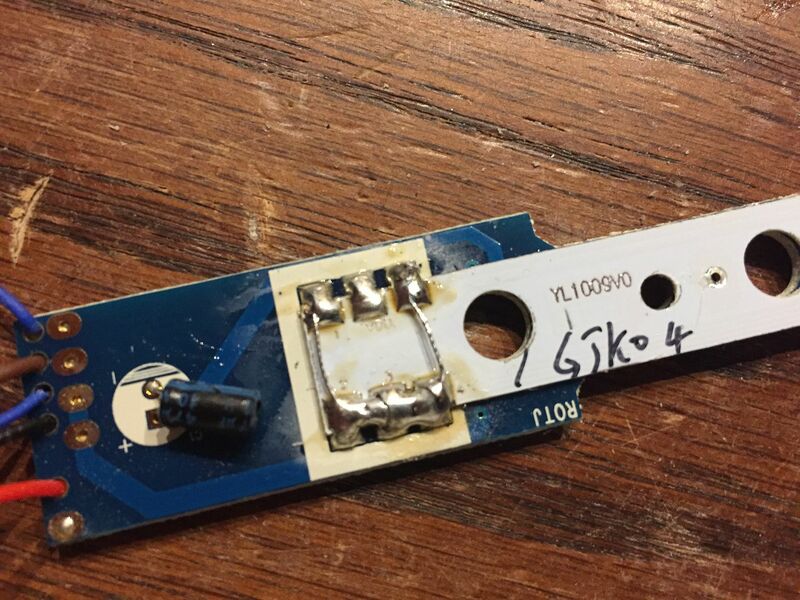 Just wire the new LED to board as shown above? Thanks for posting this, and in advance for any insight you may offer. I'll be wiring it up this eve and may see first hand what happens anyway, haha! Pics to follow, success or no! Ok! Pics coming, I finished! I must say, the blade holder is too big as noted by bones22 above. A lot of dremel sanding and I got it in there. Very happy other than that. 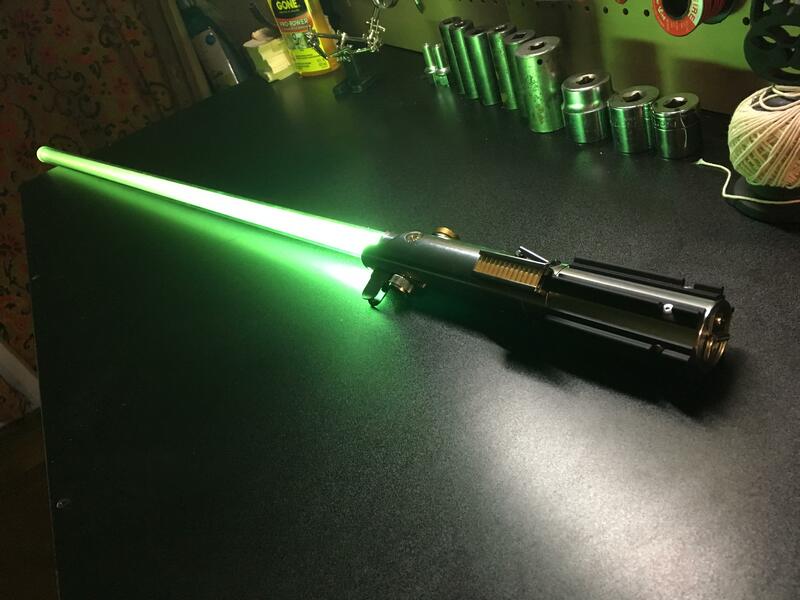 Removable duel blade, and green tri Cree LED. 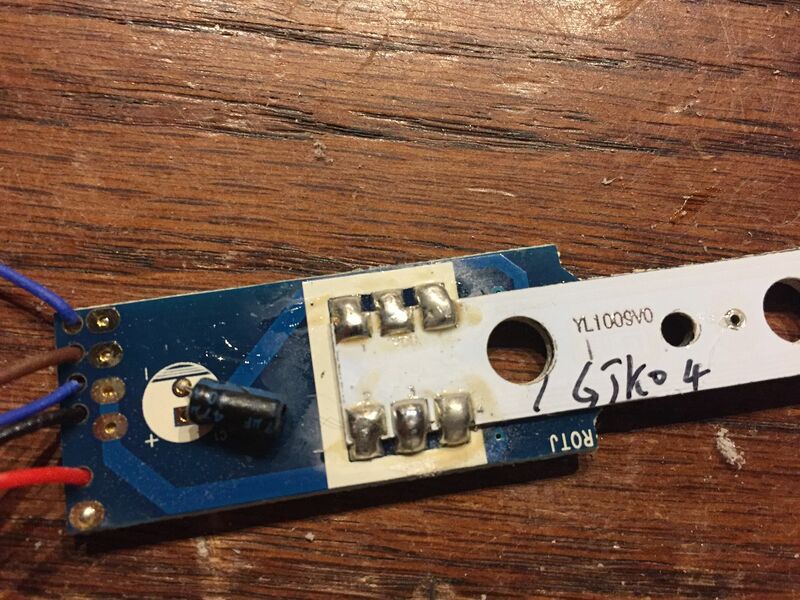 I found the answer to my question above by trial and error - no resistor needed on this conversion. 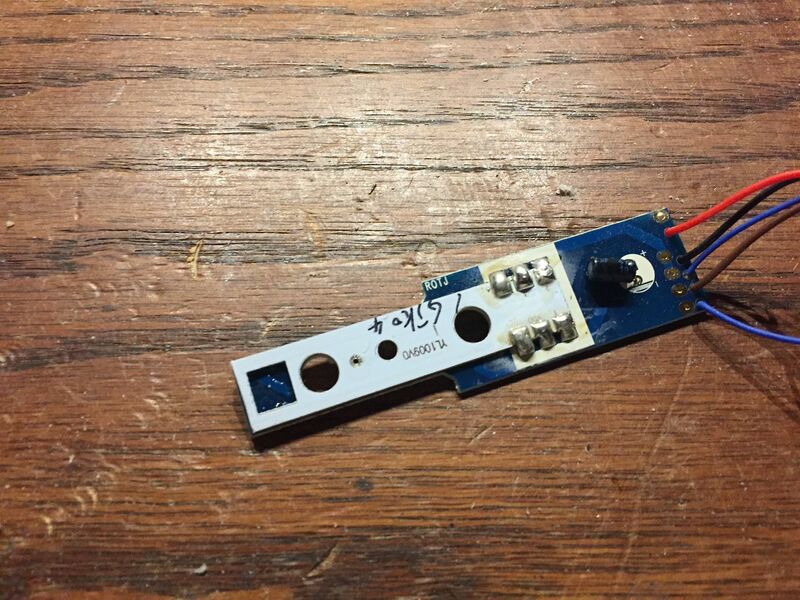 LED is wired right to the board. Last step soldering the switch. Last edited by jamielay; 02-11-2018 at 12:59 PM. Reason: Added pics.